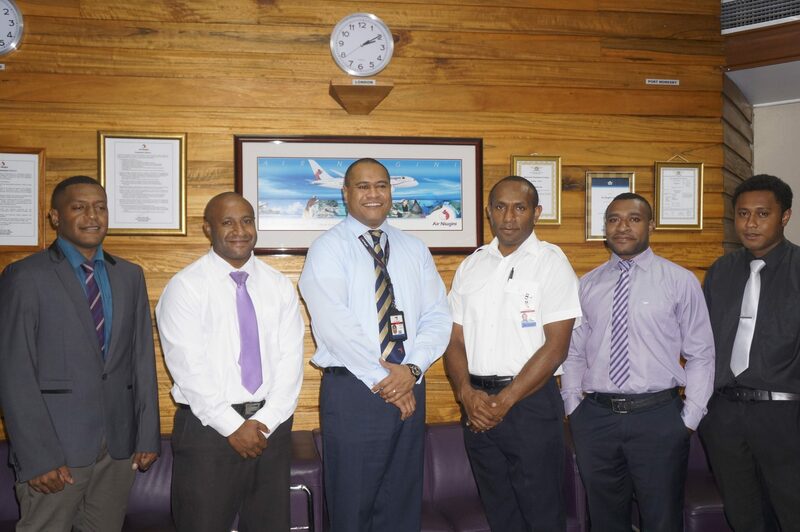 Four successful young Papua New Guineans signed their contracts with Air Niugini as pilot cadets under the airline’s National Cadet Pilot Training Program. The cadets were rigorously selected from over 1000 applications nationwide. A shortlist of 400 underwent entry testing resulting in only 20 applicants who attained the pass mark of 80% for the next assessment and selection phase where the top four cadets were selected. The selection process carried out included academic ability, internal aptitude tests and interviews conducted by Air Niugini’s Flight Operations Department. Pilot cadets Iga Kila, Bradley Richard, Ezekiel Koralyo and Gabriel Kale will leave for their initial 18 months pilot training at the Professional Pilots Training centre in Coffs Harbour, New South Wales on Friday 08th July, 2016. Following the successful completion of their training they will graduate with their Commercial Pilots Licence (CPL) and multi – engine instrument rating. The pilot cadets will return to Air Niugini andl continue their inflight training as Cadets. One of the pilot cadets, Gabriel Kuri Kale is partly sponsored under the Memorandum of Agreement signed between Sinasina Yongomul MP, Honourable Kerenga Kua and Air Niugini. The agreement enables successful applicants from the Air Niugini selection process from Sinasina Yongomul District in the Simbu Province to be recipients of the joint sponsorship provided by Honourable Kerenge Kua and the national airline. Gabriel Kuri Kale is the second pilot cadet who is a recipient under this MOU. Since the inception of the cadet pilot training program, Air Niugini has graduated over 80 national pilots – men and women who now serve in the flight crew of all its aircraft from Dash 8s to Boeing 767s. The program has graduated seven young women – and the aim to increasing that number is a high priority. Captain Beverly Pakii made history in April 2015 when she became the first female to achieve her command on the Dash 8 aircraft under the Air Niugini Pilot Cadet Program since the commencement of the program in the 1970s.